One of the best known means of transportation in London is the Tube. It is also a world famous symbol for the city. It is known as the London Underground or the Underground and it represents a British metro system serving Greater London and parts of Essex, Hertfordshire and Buckinghamshire. The system features 402 kilometres of track and it serves no less than 270 stations. Out of the 402 kilometres, 45% is underground. London Underground features the world’s first underground railway. It was established in 1863 and now it is included in the Metropolitan and Circle, Hammersmith & City lines. In 1890, it was also the first line operating underground electric trains. Currently, that is included in the Northern Line. The network’s first tunnels were constructed below the surface and the renowned tubes or the circular tunnels were built much later. In 1900, the Central London Railway was founded and at the time, it was called “twopenny tube”. In the 20th century, the lines became known as the Underground and this name was written all over the signs and maps in the stations. The railways were ran and owned by private companies that formed the London Passenger Transport Board in 1933. The first tube map was published the same year. Between 1968 and 1971 the Victoria line was established and in 1979 the network saw the opening of the Jubilee line. The second one was extended 20 years later. In the 1980s, the administration introduced the Travelcard. The Oyster card appeared later, in 2003. Currently, the entire underground system is known under the name “tube”. Moreover, the tube map features also the Emirates Air Lines, the London Overground and the Docklands Light Railway. 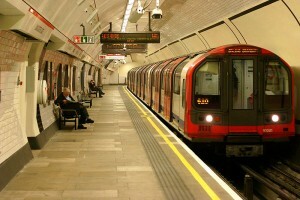 When it comes to the route miles, the London Underground is the world’s 4th largest metro system. It is surpassed by the Beijing Subway, the Shanghai Metro and the Seoul Metropolitan Subway. The network represents Europe’s 3rd busiest metro system, with almost 1.2 billion passengers per year. For the moment, the London Underground is being improved so as to increase its capacity. In 2013, the London Underground celebrates 150 years. The first underground railway connecting City of London with the urban centre was planned in 1830 and the first line was constructed in 1854. However, the first underground railway in the world was opened in 1863 and it linked Farringdon with Paddington. The second line was opened in1868 between Westminster and South Kensington. The Circle line was completed by the District and Metropolitan railways in 1884. The railways expanded rapidly and throughout the years new lines were built, reaching 402 kilometres of track in the present days. The fares for the Underground system are calculated using the zonal fare system. It incorporates 9 zones. Central London is part of zone 1, including the south of Thames River and the Circle line. Zones 7, 8 and 9 are part of the Metropolitan line and they’re located outside Greater London. There are also stations included in 2 zones and these have the cheapest fares. You can use both the Oyster card and the paper tickets to travel with the London Underground. The prices for a single journey depend on the fare zone you’re traveling to. Keep in mind that the tube is closed overnight, but it is replaced by the London night bus routes. The trains run from 5 am till 1 am. The lines are closed on Christmas Day and on special events the operating hours might differ, so it’s always better to know in advance what trains you have at your disposal. The Underground maps in the stations are one of London’s numerous trademarks. You can keep them as souvenirs after you use them as your guide through London. Unfortunately, the Underground lines cannot reach all parts of London. So, in case you need to go to a location in the city that is not served by the tube system, you can always book a taxi with a private minicab company. You’ll take advantage from affordable and comfortable services anywhere in the capital city and you can even benefit from cheap airport transfers. Not to mention that they offer an excellent way of discovering the beautiful London.